Nature Provided A Solution To Thwart The Destructive Acids In Our Stomach: Lipids. Clinical studies show most hemp products absorb only 3% to 6% into the blood stream. Using our patented Optisorb™ delivery system your body gets an astounding 80% absorption rate! There’s no hit or miss. You’ll receive the full healing powers in each dropper. Absorbs in minutes. You’ll feel the difference. HEALING HEMP WITH 15X THE BENEFIT! There’s really not much benefit if your hemp oil isn’t being absorbed into your system, right? It just becomes expensive urine down the toilet. Nature’s fat molecules uniquely pass through the stomach intact enabling absorption in the intestines. Clinical trials show that our Optisorb™ technology allows hemp to be absorbed in very high levels in the blood. Without this absorption, the hemp benefits are minimal. This explains why so many other hemp products have minimal benefits or why they may seem to work at first, but then have no impact the next time. Get more and pay less with Optivida Hemp Extract. Fatty acid chains, like that derived from sunflowers, are healthy to the body. In fact, most of us don’t receive enough healthy fat in our diet. This small amount of fatty acids are used as Optivida Hemp Extracts delivery system for the hemp nutrient. As the hemp is absorbed into the system, these lipids become nutrition for your liver, brain, and cells as they are also absorbed into the body. 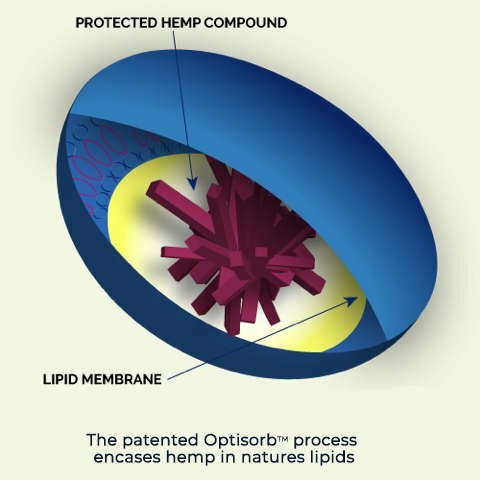 Our patented Optisorb™ process uses natural lipids to encapsulate our hemp oil. no heat, no high pressure, and no solvents are used.